Introduction: Creating visions for our future is about expressing hope and commitment, realizing that articulating a vision also commits you to manifesting that vision through a lifetime of collective work. We should all be encouraged to share our visions with one another in the hope of creating inspiration and resolve to affirm our values and challenge those things that need to change. This is a testimonial from 2065 in the voice of one of our grandchildren. Fifty years ago, New Mexico with all its beauty and rich history was in a time of crisis. For many years, New Mexico had fared poorly in national rankings, but even those had reached epic lows with childhood poverty being highest in the nation, and other attendant measures of health and well-being were similarly low. Other areas of the country were recovering from the Great Recession of 2008, but New Mexico's unemployment rate remained the highest in the United States and was not improving. We were one of the few states losing population, in large part because of the departure of younger people seeking opportunity. These numbers have never really told our story, but they were sobering nonetheless. Then, a time of clarity emerged when long-time leaders who had spent lifetimes working for the health and well-being of our communities were recognized and honored for their work, and emerging leaders looked to the elders for guidance. During this time, emerging leaders built upon a foundation of history, culture and social justice in order to create lasting change and communities where families would have livelihoods that are uplifting and inspiring and where they could practice a way of life in harmony with the land and each other. The people drew upon ancestral memories learned from storytelling by the elders or through other ways of learning. In New Mexico, visioning for the future had to be rooted in history because native peoples have lived for millennia in this beloved land. We had to retain the memory of colonialism, injustices and violence even as we had to affirm the fundamental values about community survival that define New Mexico, such as the culture of sharing, the dignity of hard work, love of the land and water, seed saving and humility. With these enduring values as a foundation, our communities needed the space for reconciliation to recover lands, languages and equity to heal past injustices and to create a vibrant future together. Through this reconciliation, a new ethic was forged, based on indigenous memory and heritage, the querencia articulated by land-based people, and the care of the Earth embraced by people from all walks of life. This ethic-a love of place and community-was the basis for core values that guided a profound transformation in New Mexico. One of the transformational changes that catalyzed numerous other reforms was a decades-long effort to raise the ethical standards of our government at the local and state levels. With high standards of ethics not only codified but cultivated through a culture of service leadership, there was a remarkable increase in democratic participation in school-board elections, county commissions, city councils and all state level positions. Through a dramatic increase in civic engagement, there was a flurry of new ideas and reforms that were tested, with many of those resulting in meaningful changes affecting everything from education to natural resources. Today, New Mexico is known as a place of hope and creativity where communities have deep roots, with an openness to embrace new ideas from other places and other peoples. Our communities breathe clean air, drink clean water and eat healthy, locally grown food because of a vibrant economy based in renewable energy and sustainable agriculture. This new economy is not only green, but it is also socially just because of conscious decisions to create such an economy in a way that would lift families out of poverty and erase structural inequities that had persisted in the old economy. Our economy was transformed when universities and national laboratories focused research and development on renewable energy. Numerous businesses grew around the growing use of solar and biomass energy, generating jobs and keeping our energy dollars in the local economy. New Mexico also became known as an innovation hub for water conservation. Driven by the reality of extreme water scarcity, local communities sought to adapt with a renewed ethic of water stewardship combined with the availability of world-class water-conservation technology. A robust local-food economy grew from a growing consciousness about health, well-being, and quality of life. This was rooted in an ancient legacy of food traditions but also driven by a broader movement toward fresh and healthy food. This was made possible because of the efforts of the caretakers of agricultural land and water rights decades before. Fifty years ago, acequias protected agricultural land and water rights by countering the commodification of water by enacting rules and enforcing decisions to stop the transfer of water rights out of agriculture. In doing so, they protected the precious ribbon of green, the irrigated farmland of New Mexico, thereby ensuring the potential for local and regional food economies. At the same time, in a synergistic way, growers began to form cooperatives to leverage their ability to feed local communities in a collective strategy. Over several decades, acequias and cooperatives evolved a dynamic and vibrant food system in which all families have access to health, local and culturally meaningful foods. Today, agriculture is a legitimate profession and dignified vocation. We continue to embark on a monumental effort to restore the health of our watersheds. Now, tens of thousands of acres of forest are thinned every year, generating more than enough biomass to provide heat and electricity in numerous communities and creating economic opportunities in local forest communities. New Mexico was one of a handful of states, 50 years ago, that bravely established a system for universal healthcare, as part of a national movement for reform. Small business owners and workers were no longer burdened with the stress of the rising and unpredictable costs of healthcare, and there was a surge of entrepreneurship in everything from high-tech businesses to agriculture and value-added businesses. Today, our children are raised in homes where families are much more likely to have a just livelihood, both in terms of income and fulfillment. Our schools cultivate young people with a sense of purpose and responsibility to their communities and with the basic competencies to pursue their educational and career goals. Early-childhood programs are universal in all communities because of the consensus that early investment in our children creates stronger communities over the long term. Through years of support, encouragement and inspiration, young people graduate at a rate of nearly 100 percent, with confidence, critical-thinking skills and values needed to make positive contributions to their communities. Furthermore, because higher education and continuing education are free, all people-young and old-have the opportunity to pursue post-secondary education. This enables adults to adapt to changes in the economy, to explore new and inspiring career opportunities and to embrace life-long learning as a way of life. Because of the efforts of those who came before us, we are grateful to those who had the courage to have a vision for the future and who set in motion the transformation that we enjoy today with healthy families and communities, a vibrant economy based on local food and renewable energy, and a society that views education and healthcare as part of the common good. All of this was possible through love and hope. Paula García lives in Mora County, where she was raised on a small ranch with her extended family. She is currently chair of the Mora County Commission, where she was elected on a platform of ethics and good government. 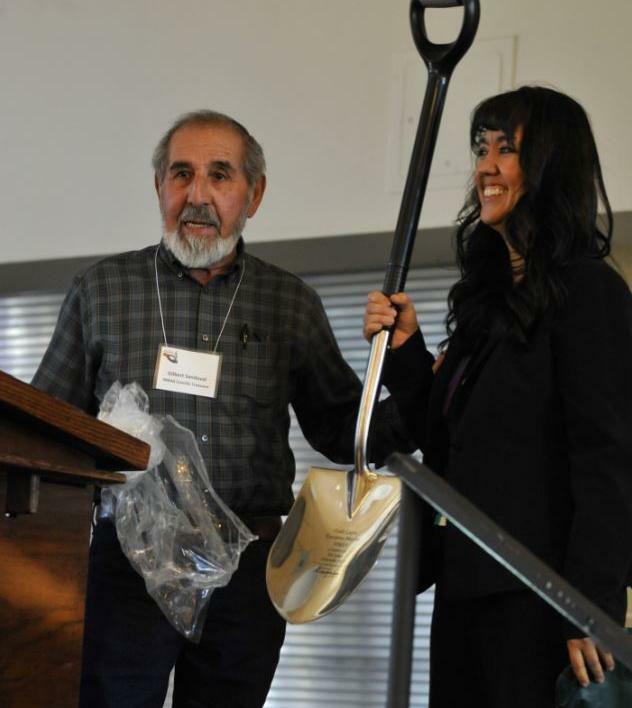 García is executive director of the New Mexico Acequia Association, a statewide grassroots organization dedicated to protecting water for acequia agriculture and food traditions.